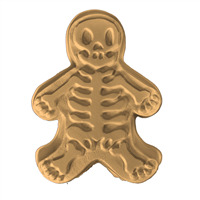 Create guest sized Gingerbread Man soaps with this plastic bar mold. 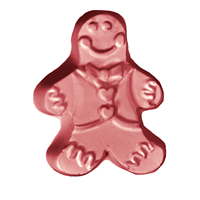 Each gingerbread has an adorable frosting smile and wears a vest with heart buttons and a bowtie! These small soaps make wonderful stocking stuffers or guest gifts during the holidays. 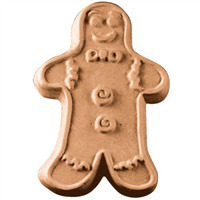 Gingerbread men date back to the court of Elizabeth I of England back in the late 16th century when she had gingerbread figures created in the likeness of her important guests. 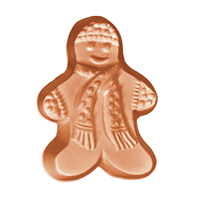 The Gingerbread Man Soap Mold is perfect for Christmas, holidays, and cookie exchange parties. Bar Depth: 0.75" Bar Length: 4.25"
Gingerbread men scared to the core reveal their skeleton bodies in this soap mold design. Create cosmetics well-suited for Halloween or Day of the Dead (Día de los Muertos) with this fun yet slightly creepy mold. Bar Depth: 0.75" Bar Length: 3.75"